A dainty little pattern for your leftovers. 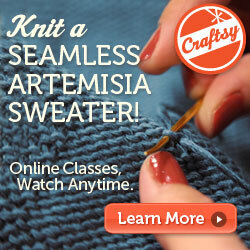 Making this is so quick and simple, that I don’t think even a beginner knitter could go wrong. I’ve included life-size schematics, so you can get away with only printing the second page. Then grab your yarn & needles & a tapestry needle and head to the park. 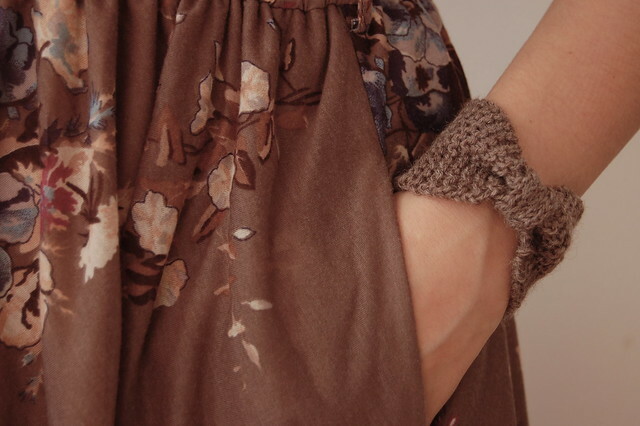 Though these photos are rather autumnal, this is actually the first pattern for my summer collection. More on that later! 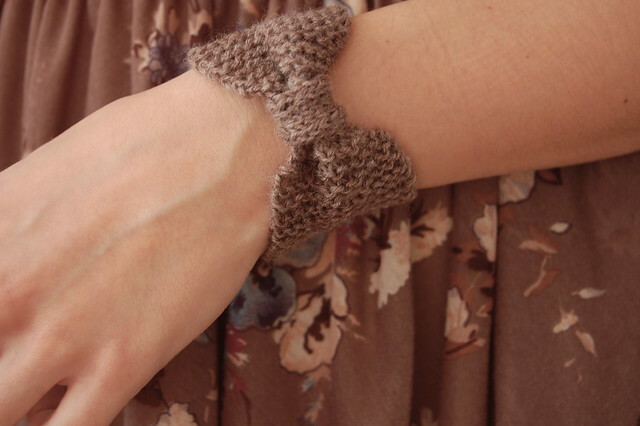 The pattern already has lots of Ravelry , and has been downloaded over 100 times. One knitter has even finished hers, out of Handmaiden sock yarn no less. See, it’s so pretty! & all manner of other small thinglings that are always getting lost. 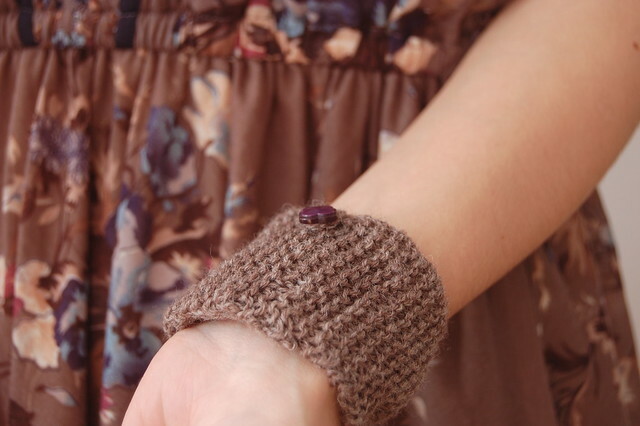 If you don’t fancy wearing it on your wrist, you can make one just to keep in your handbag / backpack / knitting bag, or even cooler, if your bag has a detachable strap, you can slide your pouch onto it! Also, this is my favourite dress. I can’t tell you how delighted I was when I got it home & found out that it had POCKETS! Many thanks to Nylwenn for the amazing work she did on the French translation! I have a feeling that if you knit La Bow Pouch in French, it will look more graceful, but I can’t be sure. :) Cliquez ici pour télécharger “La Bow Pouch”. 5th April, 2011 // Arms & Legs, Balay, Downloads // tags: bow, free, pouch, spring, summer, wristlet. That is so super clever!! Absolutely love it. Very nice, thank you! I have been enjoying reading your blog posts, sorry that I haven’t had time to comment. Made one for a guitar. It went over the neck and holds picks. Now I need one with a skull on each side. So many things I always need. Think top of the list is a front door key, Ive lost count of the times I have locked myself out and a doggie bag for those unexpected walks when I grab the lead and the dog, get to the end of the road and realise I have left the bags and the door key. So cute! I’m still knitting “late” Christmas presents, but my heart melted when I read “…a lump of sugar in case I meet a horse…” ~ ! I’d knit one for horse cookies for my horse, but he’d figure out where it is first time, and probably try to eat it ;) SO so cute! Ooh, and such a lovely dress. I <3 pockets in dresses! OH MY LORD, …YOU ARE SO VERY TALENTED ~ YOUR WORK IS TRULY ELEGANT & INSPIRING! Thank you so very much for sharing your design. Every summer at my family reunion I make something for my four daughters and one daughter in law, as well as all teen grand daughters. This is PERFECT! Thanks again!